Fall has always seemed more like the beginning of the year to me, but I am not in charge. Therefore, it is time to close out this year, and perhaps look forward hopefully to the next. It seems that many people are ready for 2009 to end, and are loudly trying to convince themselves and others that 2010 will be so much better. For me, it has just been another year. There have been good times, as well as those that have not been favorites of mine. Truth be told, the years seem to blur together with each other, and on a given day, I might not correctly state which year it is or how old I am. Still, I am knitting. I do not think I was overly productive this year, but I did make more than few things, spun a bit, and survived times when I was not up for any of it. The deadline/production mode of late had moments of exciting energy, but it also took its toll and had its depleting effects, too. However, I am coming out of that, and thoughts of new are returning. While I have felt the itch to cast on for something new, I have been unable to translate those feelings into action. Instead, I decided to work on finishing some things. I started with my sister's mohair moebius. Polly wisely advised me that it would be good to give her for New Year's, and she was right. I nearly finished it on Tuesday, but I ran out of yarn on the bind-off round. It was just as well, as I was not quite thrilled with the traditional bind-off I had used. I tinked back the 3/4 round of binding off plus another round of seed stitch, and then worked a stretchier bind off, and had about four inches of yarn to spare. 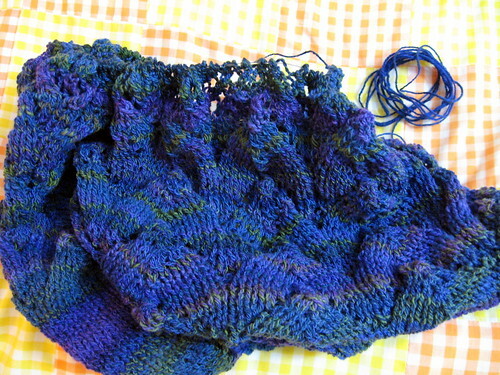 After I had the moebius soaking, I went directly to the next knit in need of finishing. This time it was something for me. I decided to figure out how I could fix my Traveling Woman shawl. I ended up tinking back five rows, skipping four rows (13-16) of Chart B, knitting the last three charted rows, and then knitting (instead of purling as per the pattern's instructions) the same stretchy bind-off I had used for the moebius. Again, I had about four inches of yarn left. I am thrilled to have been able to completely use my handspun yarn, and I will be able to begin a new year with a new shawl. I fell off the innerwebs for a bit, but (mostly) caught up with blogs (but not much with the email) yesterday and today between laundry and other assorted household tasks. It has been a busy few days, but it was pretty good, too. I spent time with family, played a little Super Mario Bros, slept, and ate. I do enjoy tasty foods, but too much all at once is not quite as enjoyable, and my body has reminded me that doing this once a year is probably too frequent. However, it has already given approval to black-eyed peas and cornbread for a New Year's celebration. Then it begins in on the new fitness routine it would like, and I remind it that we had already agreed that moderation is important in all areas of life. I have also spent some time getting to know my new books. Over the past few weeks, many new knitting, crochet, and spinning volumes have made their way to me. We just picked up the latest from the post office. There are stories to tell, pages to read, patterns to queue, techniques to try, and lovely things to make. For now, I present this sampling of the wide range of books I have received. I hope you are all having a wonderful, peaceful day. I am celebrating Christmas, though not sure whom we will see or have the chance to talk to, nor what all we will do. There is a decent chance that we could sleep all day. We are very tired. I stayed up all night finishing crocheting my brothers' gifts. I completed them in time for the gathering at my mom's on Christmas Eve. My fingers are a bit sore. Still, I grabbed yarn and needles in a last-minute attempt to knit a mohair moebius for my sister to go with the hat I knit for her. I surprised myself with how far I got on it. If I get up in the morning, I might be able to finish it and give it to her when I see her later. Then again, I may start playing the Super Mario Bros Wii game that she gave me, and that could take over for a bit. Anyway, my brothers were pleased with their gifts. The older one grumbled a bit when I asked him to sit next to the younger one so that they could unwrap together. I packaged both in the same box since I made the same things for them. The mild irritation at being directed by me could not survive in the face of what I had made. 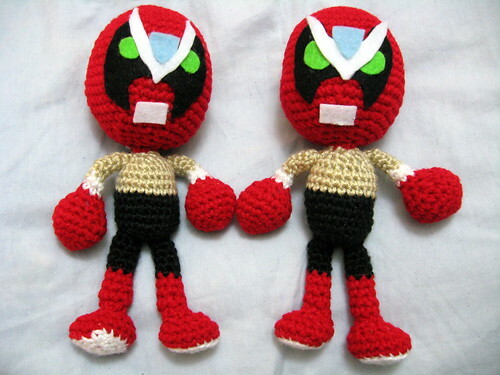 I crocheted a Strong Bad for each of them. I am not too familiar, but know they are fans, and when I saw the pattern, I knew it would be perfect for Christmas gifts for them. The mad-crochet-frenzy of the past few days has me appreciating deadline-free living. Of course, the tight gauge of those two creations and the resultant achy fingers mean that I would be unlikely to be able to make anything under pressure right now. It also means I am pushing out of my brain any thoughts about the sweater my younger brother envisions wearing next year for Christmas. He asked whether I could make my own sweater pattern. It sounds like what he wants is something that would incorporate both intarsia and fair isle, and Homer Simpson in a Santa hat. No, I am not thinking about it for at least the rest of this year. I do not feel like it is. I think I am doing OK. However, there is a little nagging thing happening. I keep getting up and looking around to find the source of a sound. I think I hear one of those electric musical Christmas ornaments playing somewhere. Did I mention that we do not have a tree or decorations? I am currently crocheting away on gifts for my brothers. The tight gauge and fiddly pieces mean I need to take frequent breaks. I clean house for when the kids and their sweethearts grace us with their presence on Friday. I stare vacantly at the television or computer. I try to come up with a good Ten on Tuesday list. This week is all about the New Year's Resolutions. Hrm. I would like to think that I am always trying to improve, so these are mostly about things I am working on currently, but there are a couple of new items for the list. No, not my mood, but instead, it is my latest FO. I knit a Darkside Cowl for a sister-in-law. With all of her on-the-go busyness and cat shelter volunteerism, I figured a cowl was a better idea than a scarf. 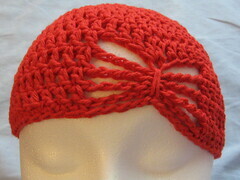 I was checking my Rav projects page and saw that I knit one of these December 17-18 last year, too. The more things change and all that, eh? Anyway, it was a quick, enjoyable knit. It has been my accompaniment for trips back and forth, and all around town. It made errands seem less hectic, and lines seem shorter. It even helped others in line who became captivated by what I was doing. One woman asked, "Excuse me, but is that needlepoint, or CRO-shay?" When I told her that it was knitting, she responded with, "Oh, I couldn't tell because your hands are moving too fast." Knitting this also gave me an even greater appreciation of my Hiya Hiya Interchangeables. Their shortest cable is the perfect size for this project. 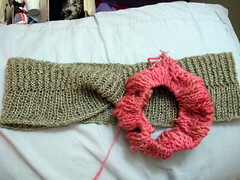 It made the knitting of the cowl even smoother. Not only was the knitting smooth, the finished cowl is nice and smooshy. I think the color will suit my sister-in-law very nicely, and keep her warm without getting in her way. In fact, I like the color (unsuccessful though I have been at capturing it with the camera) so much, I am trying to decide whether to use the second ball to knit a Darkside Cowl for myself, or turn it into fingerless mitts for the sister-in-law. However, I must first finish two other things before I can consider casting on again with the purple. It would seem that I am not the only person who has difficulty with mailing packages. A friend who moved away earlier this Fall says she also struggles with this. However, I think she waited on purpose. She waited to let my birthday celebration stretch out a bit longer. She waited to secure a personalized autograph copy of a fabulous book. She waited a bit longer to give me a much-needed boost during a difficult patch. When I wrote to thank my friend for the thoughtful gifts, she wrote back that she knew that I would love these, and that I was unlikely to purchase them for myself. She was right. I may be a bit of an emotional wreck, but these tears of love and joy have been refreshing. Now, I pet my lovely cashmere, and look through this wonderful book. There are such classic, timeless patterns. I could have almost immediately queued the entire book, but I stopped after adding two. Bridgewater and Quincy will be fabulous knits. Following can be good. I let someone else pick the 10 on Tuesday topic, so why not use the one Carole and Hillary chose? 5. Sugar Cookies--these have the colored sugar on top. You place the ball of dough on the baking sheet, dip the flat bottom of a glass in the colored sugar, and then gently smoosh the dough. 6. Peanut Brittle--I experiment with finding just the right peanuts, as there is plenty of feedback on which are the peanuts to use. 8. Hot Cocoa--It is cooked on the stove, very tasty, and is great with our with out marshmallows or whipped cream. 9. Turkey, Mashed Potatoes, & Gravy--Of course, this is good any time of year, but it helps set a festive, family-together scene. 10. Oranges, Cranberries, Pears, Grapefuit--These cool, light, refreshing treats are a special treat. An unsettling thought invaded my brain earlier this week. It went something to the effect of, "I don't think I want to knit, crochet, or spin. Maybe I do not like any of them." I walked past the stash, and the thoughts made me feel a bit ill. I looked at the books for inspiration, and a wave of meh washed over me. I did housework, slept, ate a candy bar, but mostly I sat, staring off into space. My brain was all swim-y and float-y. I conquered more household chores. Then it was time to knit with friends, and I could not find the will to form a single stitch. So, I grabbed a drop spindle and fiber, and headed out the door. I had a little coffee, chatted it up with friends, and twisted a bit of fluff. I have stuck with the mildly sparkly and now I have finished spindling the first half of the fiber I received back in June. While it is true that there were only a few grams left, I am calling this a win. Maybe I will start the second half soon. I have seen this coming for a while, so am not really surprised by it, and am taking it all in stride. With all of the housework, one might think it would be tidier around here, but I suppose the sitting while staring off into space has taken up more time than I thought. It has a reputation for doing this. Awhile back, I found a bargain on eBay, and now I am playing with this new-to-me toy. It is a nice distraction. The directions from the booklet resulted in a lot frustration, much wasted yarn, and a long timeout for the loom. I am not sure if weaving is the thing for me, but it will be fun to explore. My best discovery has been a better way to warp the loom. Since I wanted to have three scarves for the Red Scarf project, I thought that perhaps I could weave something that would work. Since I still had more of it, I decided to use the TLC Amore. I like the finished scarf, but fear it is not quite big enough. The length is 60" if you include the fringe in the measurement, and it is about 5" in width. Anyway, I may try for another, but really need to concentrate on getting to the post office. I actually do not have so much difficulty with going to the post office, but rather with getting everything packaged and ready. Not enough people emptied store shelves of milk and bread, so FlurryWatch2009 turned into snowfall the likes of which rivals that some have ever seen. OK, so, it was not much snow, but my nephew declared, "Oh, man! I've never seen so much snow in my life!" Wrapping Up the Week--and a Gift! This week, one special gift idea went away. I learned that someone let her ear piercings close. I had been narrowing down the choices for just the right pair of earrings from over at Opal's shop. It is not as though there are not plenty of other gift ideas for this young lady, but I had been thinking and planning this for months. I guess I am just glad I learned this now instead of later. With my mind still full of the sparkly and shiny, I decided to see what I could create. 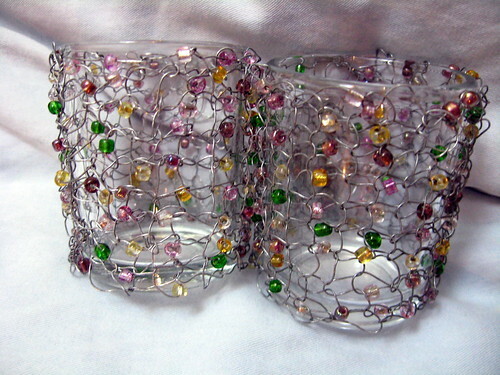 I went with wire and bead votive sleeves. I had been having a hard time figuring out a present for someone. I was almost down to just picking up a gift card, and am quite pleased to be able to give these, instead, even if they are difficult to photograph. Since life goes on, and a moebius is not always the answer, I am following other advice. It has been said by many that looking outside oneself and helping others is a good way to move through a difficulty. I can see some wisdom in that, and now you can see (two pictures of the same scarf--one shows color better, the other better shows texture, though neither photo is quite right) another finished donation for the Red Scarf Project (there's still time). That is my challenge. My Lizzie is moving to Colorado. We said goodbye tonight. As I am sure you had probably already guessed, I fell behind hard on my deadline-secret-laceknitting goal. If I had kept to schedule, I would have blocked at the end of last week. I can either continue deluding myself with the idea that I can knit the remaining stitches (totaling about 35,000) and have it blocking by Wednesday morning, or accept right now that I am not going to meet my self-imposed deadline. Then I can work out a revised plan and get on with it. I actually had a second deadline scenario for this project, and I will make that work. December has double and triple special dates for some people, so I can make these shifts and not really be late. In fact, giving this piece later might be better, or maybe it will just be different. I just know that I am not going to torture myself about this. Speaking of torturing myself, I googled a pattern the other day. I was inspired by someone else's wonderful knitting, and wanted to knit that same piece. Anyway, I found the pattern. I thought, "Neat! I did not realize this was a free pattern!" I began thinking about knitting it for different people, and maybe even one for myself, and then I thought about the yarns I would use, and how fancy it all would be. Then I began to think that it did not make sense that this pattern would be available online for free. I searched a bit more. I saw it available for sale exclusively through one retailer. I contacted the designer and the shop selling it. The shop owner replied that this was indeed a mistake, and she would take care of it. Out of curiosity, I googled it about a month later, and the pattern was still out there for all to find. Since it was only the retailer who replied, I wrote back to let her know that the situation had not been resolved, just in case she did not know, and there was no response. I just checked again, and, yep, anybody can still snag the pattern, and further investigation reveals that it has been this way since July. I feel bad for the designer, and the shop owner with the exclusive deal. I am amazed that it seems like more people have not discovered this, and wonder about the fallout when it is. Ah, but time and energy are too valuable for me to fret any longer about a problem that is not mine, nor something I can solve. I have knitting to do. Of course, the only knitting that is going well is the super-secret-deadline-lace, so I am a bit where I was at the start of this, eh? The pile next to me on the couch of knitting that did not work is too big to ignore any longer. I am returning yarns and needles to their proper places in hopes that the more ordered state helps me. So far, my efforts have yielded one lost hat. Yes, I found the hat in the same spot I looked for it last night. That does not say much for my looking or organizational skills, now does it? At least it was in the stash room, close to where it should have been, and not in the pile next to me on the couch. 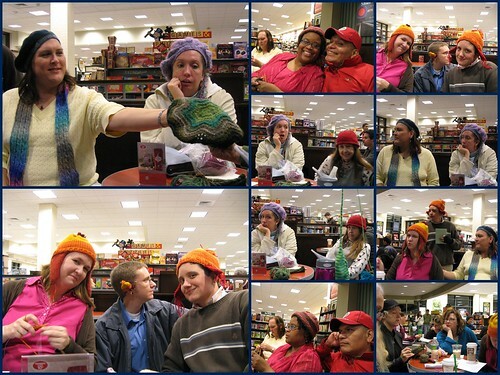 It is the first Monday after Thanksgiving, and that is Wear-A-Hat Night to Skanky Knitting. I have not been out to knit with the Skanky Knitters lately, but had to make it out for this event. Same Ol', Same Ol' on a Sunday. Yes, it is another moebius. It is for my niece. Her birthday is in a few days, and she was trying to steal the one I gave her mother the other day. I may have enough left of this yarn to make a hat to go with the moebius scarf. I might be better to leave that for a Christmas present, though. My hands and fingers are a bit on the sore, stiff side of things. Knitting does not bother them, but I will take it easy. I think I may be recovering from moebius-fever. I do not feel like I must cast on for another right now. Of course, the most recent one has only been finished for about fifteen minutes. Anyway, it is time for a new week, almost time for a new month, and every day is a new day. No, I am not going anywhere for the foreseeable future. Actually, that is a very comforting thought. Anyway, it was moving day for my sister. She just bought a house, and we were part of the moving crew. I am glad for my sister to have a house. I am glad to have been some help. I am glad to be done. For example, I almost went to Old Navy at three this morning. Then I realized that I might not want or need Lego Rock Band, have never shopped at Old Navy before, and that this is not the best time to take a chance with the budget. Finishing one moebius and then immediately casting on for the next was a better idea. This puts my total of moebii at three this week. I feel like knitting another. I wish these were unisex. Then I could have all of my Christmas knitting done by the end of next week as well as getting the Red Scarf Project very close to its goal. Thanksgiving is probably my favorite holiday. It is wonderful to have a day dedicated to being thankful. Of course, keeping an attitude of gratitude every day is best, but it is still special to have this day set aside to celebrate and focus on thankfulness. I am thankful for indoor plumbing. It makes such a difference. I am thankful for my nieces and nephews. I learn so much from them, laugh and smile more with them, and look at the world differently when they are with me. I also get to send them home. I am thankful for my mom. It has been quite an adventure over the years, and we really have a good relationship for all it has weathered. She has done so much for me, and does so much for others. Following sound advice from Cookie and Opal, I have the Traveling Woman waiting for a more appropriate time to fix it. I then took the opportunity to pursue another knitting interest--moebius. That is a different bit of knitting, for sure. I am still knitting and learning, but keeping it simple. I cast-off the first one this afternoon, and then cast-on for a new one at the next opportunity. I think that several people are going to receive a moebius scarf or cowl this year. The next one is likely to be seed stitch or lace. It is so close, and yet not nearly close enough. I have several solutions rattling about in my head. One would be to rip out that extra repeat of Chart A and then continue as the pattern directs. I do dislike that idea. Whatever I do, I should probably wait until after I get more than ninety minutes of sleep. It is a bit rough over here, and I thank you for sticking with me. I do not know how it came to this, but it is time for bed, and I have not accomplished 1/10 of what I had planned for my day. Not only am I not done with the Traveling Woman, but also, this is asleep on my couch. This is how it looked when I completed the stockinette section of Traveling Woman, and now I am on to the lace. It seems like whenever I am not sleeping or vacantly staring off into space, I am knitting on this shawl. I think I should know something soon. Since I am still coming up empty, I am going to cast on for something new. I figure it is time to give this handspun another try. Will I soon have a Lupine Traveling Woman? I hope so. 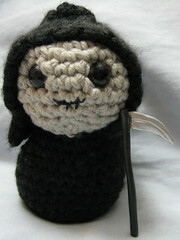 I finally got around to making the polymer clay weapon for death, and he is complaining. He says it should be bigger. He says I should have made it sooner. I told him it is not a good day to bother me about this. I said that we can re-visit the issue later, but that I am going to bed. He said it would be easy to fix, and that it would only take me a few minutes. I explained to him that it is a bit more involved than he understands. He pouted. I told him that everything is fine, even if it does not feel that way right now, that it would be unhelpful to get in a state about all that needs to be done, and that we will get it straightened out when we can. It is Thursday, so it is time to remember three more reasons to have hearts filled with gratitude. Speaking of friends, my Lizzie asked me to make this for her. I was so pleased to be able to do something for my friend. Is a newly finished knit a great way to push past the midweek meh, or what? Yes, the second moose has is done. I went down one needle size to a US 3 (3.25mm) to make this one slightly smaller. Bruce prefers the colors on this to the first. I like them both for different reasons, and cannot pick a favorite. I was surprised to enjoy the knitting of a second of these so soon, but I did. I also think that I am glad to be done knitting them for a bit. This will soon go off in the mail with its partner. A few days later, it will arrive at its destination. And there it will sit for about a month. I have it on good authority that at this house they do not unwrap gifts before the occasion arrives. In this case, it is too bad, as I am sure their temperatures are low enough that a worsted weight, stranded, wool hat would be good. Speaking of wool hats, I believe I might have a request for a new wool hat. My stepdad has made comments about his dissatisfaction with his commercial hats made of synthetic yarn. I have made him a hat before, but that was a few years ago, and I think that maybe it has been lost. His preferred style of hat is black and plain. I need to find out if he does indeed want a new hat. If that is the case, I am going to try to secretly discover if he is perhaps open to a little bit of variety. If not, I will pick up some black superwash wool and knit the standard issue winter hat. I don't do this for just anybody, but this one is worth it. 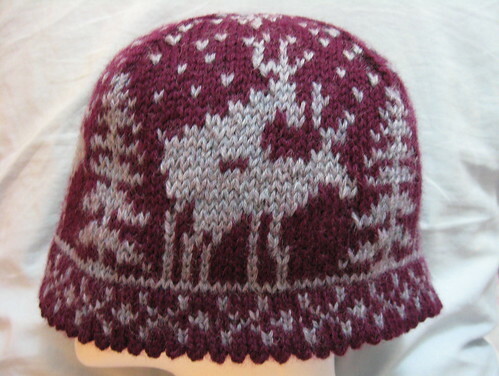 While I may not think I want to knit a plain black hat, I could find out that he would wear a moose hat everywhere. I already know that he finds them to be amusing. It has been interesting to think of the items for this week's Ten on Tuesday. I wondered about which things I would like to learn to do, and which I just wish would come to me by magic. I thought about how much time, effort, and dedication I am willing to put towards these skills. Then, I realized I was spending too much time in my head. I will attempt to tackle some of these at some point in my life. In fact, I have given real effort to some, had passing flings with others, and am currently working on a couple of items from the list. 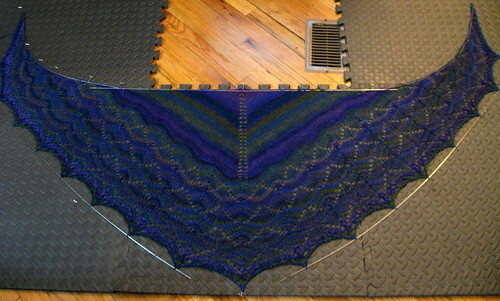 When the pattern for Olivia's Butterfly made its way to a friend's Rav queue, it caught my eye. I added it to my queue, and there it sat. Then I remembered that this round we are making hats of all sizes over at Caps for a Cure, and decided to give it a go. 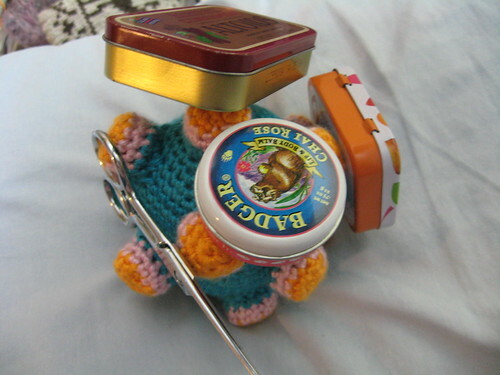 It is so quick to make and so cute. 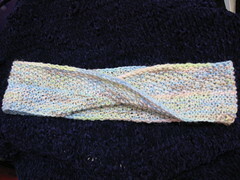 I used some worsted weight crochet cotton. I had my nephew try it on with the promise that I would not take his picture in this obviously girl's hat. He otherwise approved of the feel of the hat and its color, and the fit looked right to me. This puts my total of hats for this round up to three. I just have to remember where I put one of them and then get them in the mail. Gee, that is becoming a theme for me, eh? Like all amigurumi, at this point I am so close, and yet so far. Oh, ForForksake, (why, yes, I do quote Mr. Jefferies when appropriate) I have 24 magnets, rather than the required 28! Is that store open right now, and if so, do I feel like going there right now? It feels so good to have another finished knit. It feels even better that it is so soft and pretty. I like the choices I made with this hat. Now that I am done, I would say that it is only inspired by the original pattern, but it is just right. I am ready to wrap it up and give it to my sister. The experience with this hat has given me a much-needed confidence boost. I trusted my instincts, and it worked well. I can become caught up in so much thinking, planning, and researching that it sometimes overshadows the joy available in the things I do. Knitting this hat reminded me that I have some experience and abilities, and it can be good to let them be my guide sometimes. Taking the time to reflect on reasons to be thankful, and remembering to allow the time to feel and express gratitude are surefire ways to improve any day. Carole was inspired to share three thankful thoughts on Thursday, and has encouraged others to participate. 1. I am thankful for the VA medical system. They have cared so well for my husband over the years. I am amazed at how well they are able to do all that they do. We have scratched our heads at some of the ways they do things, but they continue to grow and change in order to meet the needs of their changing population of veterans. 2. I am thankful for coffee. The flavors, aroma, and caffeine certainly give an extra bit of loveliness to my day. However, it has added so much more to my life. I do not know how many times grabbing a cup of coffee has been the excuse to get together and spend time with wonderful people. Whether we are idly chatting to the accompaniment of clicking needles, pondering deep questions of life, or just taking time out of the day to stop and connect with others, coffee has been there. 3. I am thankful for my husband. He knows me better than anyone else does, and he still likes me. He accepts me where I am, while supporting and encouraging me to grow and learn. That is not an easy balance, but he does it so well. He has cared for me in so many ways. He keeps me from taking myself or anything else too seriously. He appreciates me, and values who I am. He loves me. A Knitter's Prerogative, aka, Oooh, Shiny! The flash of inspiration came and went quickly. The mountain of mohair appeared to be in danger. I put it back in the bag, placed it on top of the books, and brought it to the stash staging area in preparation for putting it away. Then, I did not sleep. I almost caught up on blogs and email. Then maybe there was some kind of magic that eludes recall, I had the same pile of mohair back in the living room along with beads and a different book, and I am casting on for something new. 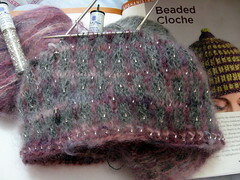 I am knitting the Beaded Cloche from Folk Hats. I remember that my sister liked this hat, and I wanted to knit a gift for her. Well, I am actually knitting a hat that is inspired by that pattern. Of course, I am not using the recommended yarn, and I am making several other modifications, chief amongst them being the fact that I am not pre-stringing the beads. 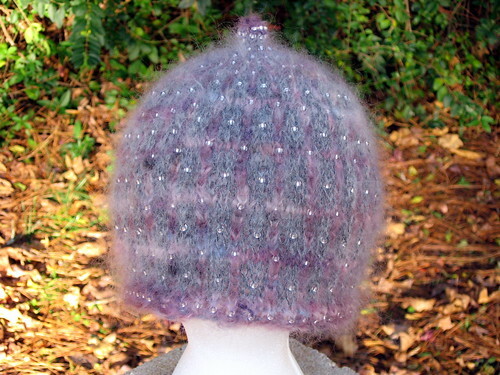 The pattern calls for 910 beads to be threaded onto the mainly mohair yarn before knitting. I knew that was not about to happen. I also figured that I was going to have different gauge, looked at the chart, reduced the initial number, and decided to see what would happen. 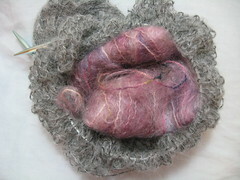 I know that is risky business when mohair is the main fiber, but I think it is working. Already, I find myself thinking about knitting another, all the while mentally flipping through lists of potential recipients. Wanting to be able to give the knit to several different people all at once is always a good sign. Many times my like or utter contempt for a remake depends on how I felt about the original version. If I loved the original, the new one probably irritates me intensely. If I was not around for the first go, I am usually more open to a different take on the song. Sometimes the new interpretation is not necessarily an improvement, but good in another way. This brings us to the Ten on Tuesday topic. I like these remakes, and I like many of the originals. After writing this list, I have a good soundtrack in my head. I will take that any day. With the secret lace back on track, it has become safe to allow my mind to wander. That can end poorly. However, I sometimes remember important things, solve problems, or have good ideas. Doing this while knitting lace is especially inspiring without allowing my brain to run too far. Today it found its way to a general list of to-knit items. I have been planning to knit some lace scarves, but have not gotten any further than that. I decided to get on with process, and happened upon a theme. All of the yarns I selected have mohair as the main fiber content. Still unsure of what to knit, I reached for A Second Treasury of Knitting Patterns and Knitted Lace of Estonia from the bookshelf. Now all that remains is selecting patterns. Oh, and the knitting of course, but that is the easy part, right? I am not even bothering to calculate how many steps back I am. We have coffee once more, so whether I keep sliding back, or if I make forward progress, I will do so a bit more quickly. Or, as it has been written elsewhere, "Drink coffee, do stupid things faster with more energy." Speaking of making mistakes with speed that take hours to fix, I have been tinking lace. Instead of being fifteen rows ahead, I am behind by about ten. Also, I do not think I like The Manchurian Candidate, but cannot be objective because the rip and repair occurred while watching that particular movie, and most things were to my dislike at that time. Still, there are things that I like very much. For example, this silk cap that my grandma sent me. Mmmm...worm spit. This house has no coffee. 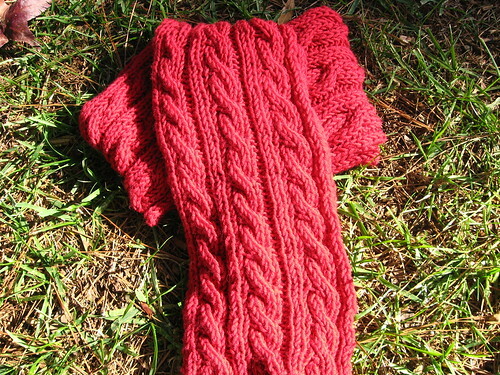 It is Red Scarf time again, and my needles are busy. I am knitting the second, and just getting around to showing the first. The discussion about the need for quality scarves stirred my heart. I am pleased with this scarf, and glad to have a contribution to offer for this important project. When I was younger, someone could say something horrible to me and I would say nothing because I was scared. That is no longer the case. Still, I usually do not say anything because I do not want to expend the energy. However, there are times when it feels right to put a stop to someone trying to steamroll over me and be hateful. Picture it, the booth of a woodworker at a fiber festival. Nevermind, I had my camera. I am looking at wooden sock blockers on a table. I am about to begin to speak with the vendor when another festivalgoer approaches. BK (BitterKnitter): It won't matter. You have to learn to knit nice, first. Me: Ah. I actually do knit quite well. Vendor: Well, if you are knitting socks, I can tell you're no beginner. BK: (pulling open jacket and puffing out chest) Well can you tell that I am not a beginner with this sweater I have knit? Me: Hmmm. It is very nice. BK: I have been knitting since I was ten. It was doll mittens then. Me: (begins walking away) Ah. Well it sounds like you have probably been knitting longer than I have. It was more comical than anything. Still, it made me wonder. 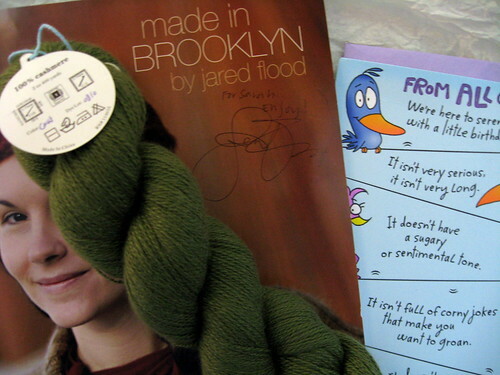 It also made me want to take a walk to fondle fiber before returning to buy my set of sock blockers. Now I just need to find sock mojo. I thought for sure this gift would have brought it around. Perhaps it is just being considerate and waiting until the new year. Wednesdays are for the Random, Right? I am working on a super-secret-deadline-lace project. If my calculations are correct, I must complete 27 rows, which totals around 2500 stitches (give or take, what with changing stitch counts) each day to finish in time. I have remembered to include time for blocking and drying. I am currently choosing to believe that my biggest challenge will be the sharing of the one magnetic board for my two current chart projects. Yes, they are both deadline knitting. Yesterday's Ten on Tuesday topic has been detrimental to my productivity. I have been playing games and having fun. I have lost part of a fancy hat I began knitting in September. I had the opportunity to check fit on the intended recipient, and it is nowhere to be seen. It is in none of the cleverly organized places it should be, and asking me where I last saw it is not helpful. Scarves are often stubborn, tricksy, and false. I have been knitting on what is attempting to be the Red Corrugator of Doom often, and sometimes for extended stretches. It is not yet 36" long. 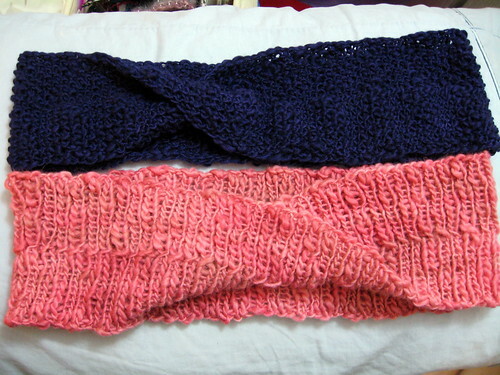 I wanted to have at least three good scarves for the Red Scarf Project, but this second scarf is out to get me. Not that I do not enjoy having you here, but I thought I would send you away in hopes that you will win prizes. The deadline is today to enter for Hillary's contest. 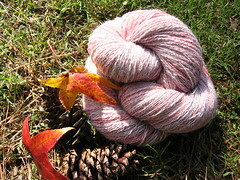 You have a week to make it over to where Phyllis is giving away some beautiful fiber. Finally, a Ten on Tuesday topic that speaks to me. Wikipedia--everything is true on this uneditable collection of topics, right? Quizzes--how else would I know that the innerwebs judge me to be: 67% knitting addicted, the delete key, angora fiber, bubblegum flavored gum, Shropshire Sheep, 72% pure, interchangeable needles, mohair yarn, a Knitting Goddess, and that if I were a felony I would be stalking? I finally finished my first pair of gloves. They are toasty warm, and the fit is good. 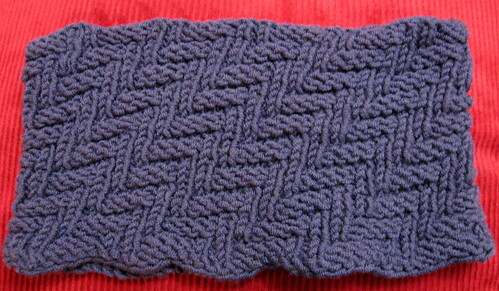 The pattern is Annemor #8 from Selbuvotter. The yarn is Knit Picks Palette in Clematis Heather and Rainforest Heather. I like the way the colors work together, but sometimes wish I had chosen ones with greater contrast. They had sort of had their public debut at the fiber festival, but they were hidden most of the day because I wore a pair of mittens over them for greater warmth. I did show them off once, but that had more to do with a weather discussion than one about my knitting. I cast on for them on New Year's Day. I finished towards the end of October. It does not bode well for my career in glove production. Perhaps I ought to keep this as just a hobby, eh? With the extended break between the first glove and the second, I did inadvertently make a change. The undersides of each thumb are different, but if I do not point it out, no one else is likely to notice. Anyway, I am glad to have knit a pair of gloves, and will probably knit more some day, but that day is unlikely to come soon. Maybe it is just the joy of getting back that hour with the return of standard time, but I have decided to do NaBloPoMo again this year. However, I have not decided to do NaKniSweMo. I enjoyed participating last time, and was excited to be making something for my sister. However, the list of things I want to knit right now is very long, and there are not any sweaters trying to jump to the head of the line, so I will let that challenge be for another year. This looks to be a busy month. The full moon is tomorrow, and later there will be a Friday the 13th. My sister is buying a house, and moving day is toward the end of the month. That is exciting. Before we jump to far into the new month, I will share three tidbits from the last day of October--two good, and one unfortunate. 1. I stood in line for one of the games with my sister and nephew at a Fall festival. Two teenagers approach to replenish a candy bowl. They declared what I am doing to me neat, and that I am smart to have brought something to pass the time. 2. At the same Fall Festival, I walked and knit, and a boy of about eight dressed as a young Obi-Wan Kenobi approaches me. He states, "You're knitting. How do you do that?" I stretched out my arms to show what I was doing. "Oh, I thought you went like this," he said while wildly moving his hands up and down. "I want to knit," he states. I tell him that he is certainly old enough and if he wants to learn, he certainly can. His mother, worried that I am being bothered, pulls him aside and begins listing the people in the family she thinks might know and be able to help. 3. At the mall for trick-or-treating at stores, we pass a group of costumed and decorated people. One individual catches our eye. She is wearing jeans and a half-shirt, is possibly with child (but possibly not), and has some animal painted on her abdomen. There are no pictures because it would have been too terrible. This guy looks like he has been to his share of fiber festivals. He took the crowds and cameras in stride. He did not mind our presence, or having to attend the gathering, but he was clearly not impressed by any of us. Just to show it is not just about fiber acquisition around here, this is my latest finished spinning. I like the new yarn. For me, it seems like I keep spinning, and suddenly one skein shows my improvement all at once. This is one of those skeins. I keep petting it, and thinking of what I want it to become. I feel so very loved today. It is my birthday. Bruce was sneaky and got me this set of Hiya-Hiya Interchangeables. They are awesome. This set goes from US2 to US8. Those are my sizes. Also, no tool is necessary to attach needles to fabulously flexible cables. The gorgeous bag that holds them is a great size, has little zippered pockets, and is too precious. A new set of needles always makes me want to immediately cast on for something new. It must be lace, I am sure. I was already flying high about my new needle set when I went to the mailbox. There was a package for me. Inside, I find this t-shirt. About an hour earlier, I had just been talking about it to friends, and how perfect it was for me. Guess who had sent me the shirt? Yes, my Lizzie is the best. She said it was good that I did not look too closely at her as I described the shirt, as she was about to burst. My heart is still bursting with love, joy, and gratitude. After skipping a year, I returned to the Harvest Days and Fiber Festival at Cannonsburgh Village in Murfreesboro, Tennessee. Since other non-fiber folks accompanied me, it was an abbreviated visit. However, the festival is tiny, so I was able to see everything. It seemed to me that there were a few more and different vendors than in years past. By the time we left, the sun broke through the clouds, brightening and warming the afternoon. However, when we arrived, it was overcast and chilly with intermittent mist. The homemade ice cream vendor looked more than a little glum. Most fiber folks had watched a weather report, understood the situation, sucked it up, and carried on with business. They began their day with a positive attitude, smiled brightly, and proclaimed it perfect wool weather. Then there were the few who allowed the damp, chill, and grey affect them. They remained hunkered down under their blankets in folding chairs, apparently uninterested in making a sale, and sometimes flatly ignoring me when I attempted to engage them in conversation. It was no matter to me, as I just moved on to the next booth. Oh, and I certainly did find many other booths to enjoy. There were many piles of fluff calling out to me like so many baa-ing sheep. I had formulated potential purchase plans before arriving, and of course, harbored fantasies. I secretly hoped to find a bargain on used books, magazines, and weaving equipment. Yeah, the weaving bug has been trying to infect me lately. Anyway, I wanted to purchase some bamboo fiber, as well as some wool/tencel blend top. On my first pass through, one bright and beautiful braid caught my eye. 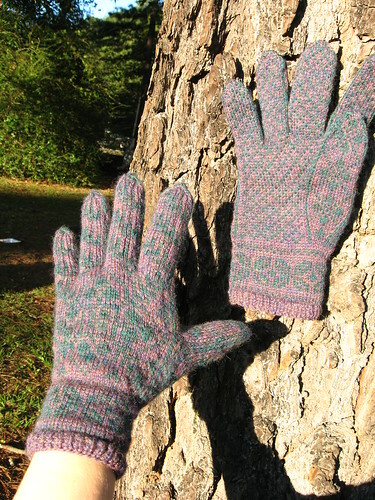 My hands were still gloved and mittened, but the fiber felt wonderful against my neck. When I saw that it was a six-ounce bump, I knew for sure that it should come home with me. Chrysalis Fibers superwash merino in Grinchy was my first purchase, as well as one of their dyed silk hankies. Even though I have yet to do anything with it, I find myself wishing I had picked up more. Silk hankies look like they could be addictive. I was unsuccessful in my tencel acquisition attempts, but found some lovely bamboo. I picked up a little bit of some silky black, and then sifted through the pile of vibrantly dyed bamboo. At first, the vendor thought I was displeased with the similar range of colors, but I assured her that I found them all to be absolutely gorgeous. Choosing amongst the brilliant hues presented a happy dilemma. With an overall fiber gain of less than three-quarters of a pound, I am very happy with my choices for the day.